Behind the picturesque landscape of the Nagacadan Rice Terraces (NRT) in Kiangan, Ifugao, the realities on the ground experienced by farmers are worrisome. From the infestation of the brown leaf hopper to the invasive kiwit, the NRT is struggling to survive. The task of conserving and restoring the NRT is enormous. But local farmers are resilient and in their small yet organized response to the challenges is a big hope in the continuing survival of the NRT. The NRT is a UNESCO World Heritage Site, Globally Important Agricultural Heritage Site (GIAHS) and at the same time as host to the open air museum. As a World Heritage and GIAH Sites, the NRT is a cultural and important agricultural landscape not only to the people of Kiangan but to the world. But the landscape is changing on the ground. The approximately 20-hectare NRT have two faces. One for the incursion of the “high yielding rice variety” that comes with the use of synthetic fertilizers, pesticides and insecticides. The other face is the continuing production of heirloom rice which is not also spared from the use of fertilizers and insecticides. Attached to these two face is the use of modern techniques and traditional practices. An illustration would be one farmer uses his traditional ways to clean his rice field and the other farmer uses a powerful herbicide to extinguish weeds. Traditionally, the NRT follows an agricultural cycle which usually starts in December when the rice seedbed is prepared, followed by the planting season by January then harvest by June and July. After harvest, they clean the rice fields, check the rice paddy dikes and start making a pingkol (mound out of rice stalks). Then the farmers plant vegetables. After some months, they spread the mound in the rice field. Weeds that are not composted are placed at the rice terraces walls. Between harvest and before the land preparation, farmers can gather five kinds of shells in the rice terraces. But with the introduction of “high yielding variety” through the municipal Department of Agriculture, the traditional rice production started to shift. Although, our guides during the Satoyama tour explained that the NRT is like 50-50 in terms of the presence of traditional and high yielding variety. Jimmy Codamon, an indigenous knowledge holder and manager of the NRT Open Air Museum, explained that farmers are left without much option when they were offered to plant the rice introduced by the municipal agriculture office. According to him, in a cash crop driven economy versus subsistence farming, a farmer would choose a rice that can be planted twice in the rice terraces. For farmers, an extra rice would mean income which they can use to send their children to school and other expenses. Codamon, further stated that the “high yielding rice” came without the use of pesticides and fertilizers. In another sharing with David Dulawan, an NRT resident and who conducted a study on the presence of kiwit (Asian swamp eel) in the rice terraces is causing damage. The water retention in the rice terraces decrease due to the holes made up by the kiwit. According to Dulawan, during lean season where “kiwit gatherers” use electricity to catch the eels, at least 20 heads can be gathered from one rice paddy. And if they return the next day to the same rice paddy, they can still collect at least 10-15 heads of eels. Added to this kiwit problem is the infestation of the brown leaf hopper. As observed during the tour that the rice plants attacked by this pest do not fruit. Farmers need to plant the short-term rice to catch up to the other rice. Today, there are initiatives by the different stakeholders to revive the heirloom production as an option in the conservation of the NRT. But this is not an easy task that farmers are willing to welcome in their open arms. 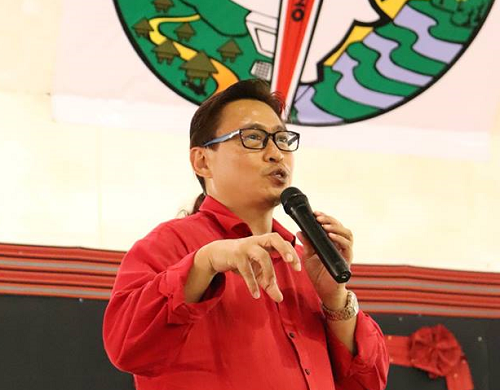 Codamon, again highlighted the dilemma of farmers in going back with the old form of farming since heirloom rice do not compensate their expenses. Other problems he identified are the lack of consultation regarding projects and their sustainability in the community. He made an example of a million-worth irrigation which is not functional because farmers’ voice are not consulted. Aside from this, he lamented the weakening traditional rice practices because of multiple reasons.